To borrow a computer term, if Ayatollah Khomeini, Osama bin Laden, and Nidal Hasan represent Islamism 1.0, Recep Tayyip Erdoğan (the prime minister of Turkey), Tariq Ramadan (a Swiss intellectual), and Keith Ellison (a U.S. congressman) represent Islamism 2.0. The former kill more people but the latter pose a greater threat to Western civilization. 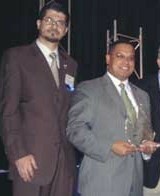 Hussam Ayloush (l.) hosted Congressman Keith Ellison (D-Minn) at a CAIR event in November 2007. The 1.0 version attacks those perceived as obstructing its goal of a society ruled by a global caliphate and totally regulated by the Shari'a (Islamic law). Islamism's original tactics, from totalitarian rule to mega-terrorism, encompass unlimited brutality. Three thousand dead in one attack? Bin Laden's search for atomic weaponry suggests the murderous toll could be a hundred or even a thousand times larger. However, a review of the past three decades, since Islamism became a significant political force, finds that violence alone rarely works. Survivors of terrorism rarely capitulate to radical Islam – not after the assassination of Anwar el-Sadat in Egypt in 1981, nor the 9/11 attacks, the Bali bombings of 2002, the Madrid bombing of 2004, the Amman bombing of 2005, or the terrorist campaigns in Israel, Iraq, Afghanistan, and Pakistan. Terrorism does physical damage and kills and intimidates but it rarely overturns the existing order. Imagine Islamists had caused the devastation of Hurricane Katrina or the 2004 tsunami – what could these have lastingly achieved? Non-terrorist violence aimed at applying the Shari'a does hardly better. Revolution (meaning, a wide-scale social revolt) took Islamists to power in just one place at one time - Iran in 1978–79. Likewise, coup d'état (a military overthrow) carried them to power just once – Sudan in 1989. Same for civil war – Afghanistan in 1996. If the violence of Islamism 1.0 rarely succeeds in forwarding the Shari'a, the Islamism 2.0 strategy of working through the system does better. Islamists, adept at winning public opinion, represent the main opposition force in Muslim-majority countries such as Morocco, Egypt, Lebanon, and Kuwait. Islamists have enjoyed electoral success in Algeria in 1992, Bangladesh in 2001, Turkey in 2002, and Iraq in 2005. Once in power, they can move the country toward Shari'a. As Mahmoud Ahmadinejad faces the wrath of Iranian street demonstrators and bin Laden cowers in a cave, Erdoğan basks in public approval, remakes the Republic of Turkey, and offers an enticing model for Islamists worldwide. Sayyid Imam al-Sharif, the Egyptian theorist of Al-Qaeda, changed his approach and now endorses lawful Islamism. Recognizing this pattern, Al-Qaeda's once-leading theorist has publicly repudiated terrorism and adopted political means. Sayyid Imam al-Sharif (b. 1950, also known by the nom de guerre Dr. Fadl) was accused of helping assassinate Sadat. In 1988 he published a book that argued for perpetual, violent jihad against the West. With time, however, Sharif observed the inutility of violent attacks and instead advocated a strategy of infiltrating the state and influencing society. 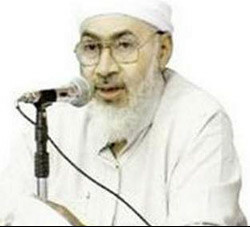 In a recent book, he condemned the use of force against Muslims ("Every drop of blood that was shed or is being shed in Afghanistan and Iraq is the responsibility of bin Laden and Zawahiri and their followers") and even against non-Muslims (9/11 was counterproductive, for "what good is it if you destroy one of your enemy's buildings, and he destroys one of your countries? What good is it if you kill one of his people, and he kills a thousand of yours?"). Sharif's evolution from theorist of terrorism to advocate of lawful transformation echoes a much broader shift; accordingly, as author Lawrence Wright notes, his defection poses a "terrible threat" to Al-Qaeda. Other once-violent Islamist organizations in Algeria, Egypt, and Syria have recognized the potential of lawful Islamism and largely renounced violence. One also sees a parallel shift in Western countries; Ramadan and Ellison represent a burgeoning trend. In conclusion, only Islamists, not fascists or communists, have gone well beyond crude force to win public support and develop a 2.0 version. Because this aspect of Islamism undermines traditional values and destroys freedoms, it may threaten civilized life even more than does 1.0's brutality.